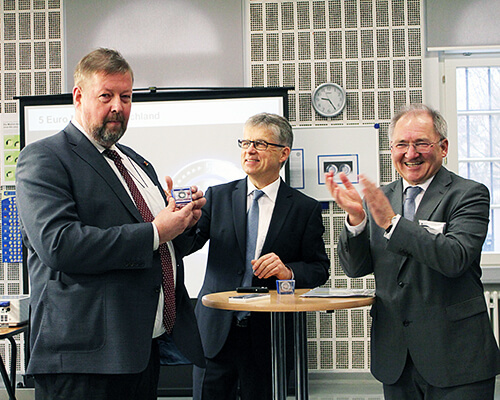 In the presence of Peter Huber, head of the State Mint of Baden-Wuerttemberg, State Secretary Peter Hofelich officially executed the first strike of the innovative 5 euro “Planet Earth” coin with its polymer ring on Thursday (11 February 2016). Adding a translucent polymer ring to the coin makes it a world first for the coin industry. “Today we do not only strike the first German 5 euro coin, but we produce the world’s first 3 material coin featuring an innovative translucent polymer ring. 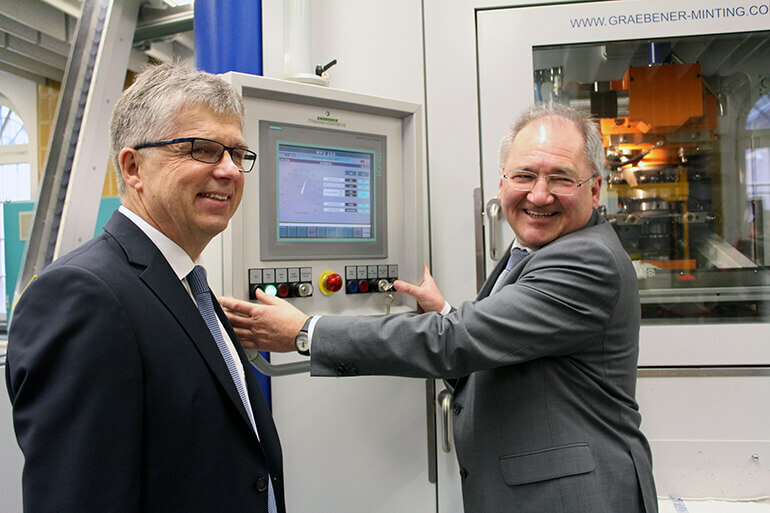 This is a world first for the coin industry”, said State Secretary Peter Hofelich at the first strike ceremony in Karlsruhe. “I am especially pleased that the State Mints of Baden-Wuerttemberg played a substantial role in the development of the 5 euro coin,” says Hofelich. 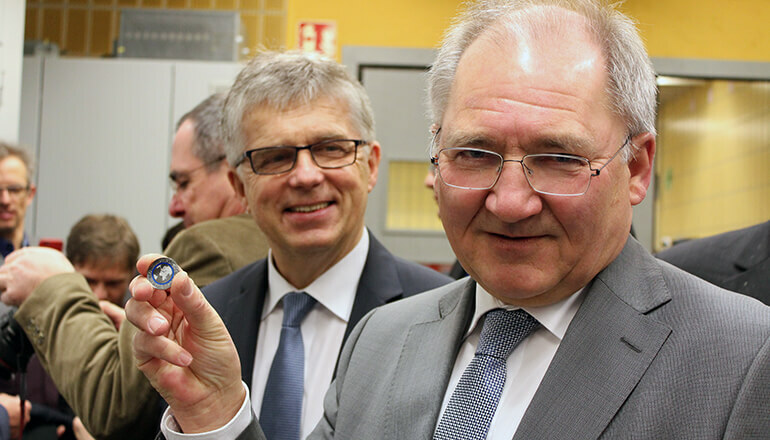 State Secretary Peter Hofelich (r) and Mintmaster Dr Peter Huber (l) with one of the first of 2 million 5 euro coins in brilliant uncirculated. The total mintage amounts to 2.25 million; 2 million of which will be in brilliant uncirculated, 250,000 will be in proof quality. 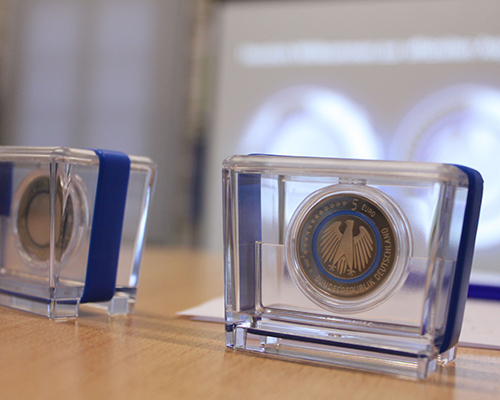 The coin’s winning motif was designed by Stefan Klein and Olaf Neumann from Iserlohn. Planet Earth is depicted in the inner circle of the coin, with its continents shown as dotted masses. The planet is encircled by the blue ring, which represents the link between Earth and the cosmos. Due to its security features which easily can be read by vending machines, the coin with the high tech polymer was chosen from a number of projects. The Bundesbank supported the innovation for its high degree of technical security and its easily identifiable overt security features. The development period lasted eight years.